Now that the weather is finally cooling off….. doesn’t this look totally awesome!!!! Although this dish looks like a big bowl of oatmeal, there isn’t an oat or a grain in sight. Honeycrisp apples, medjool dates, cinnamon, and nutmeg are tossed into a food processor and whirled to sweet perfection. Then, another honeycrisp apple is finely diced and stirred into the apple-date mixture along with two tablespoons of chia seeds. 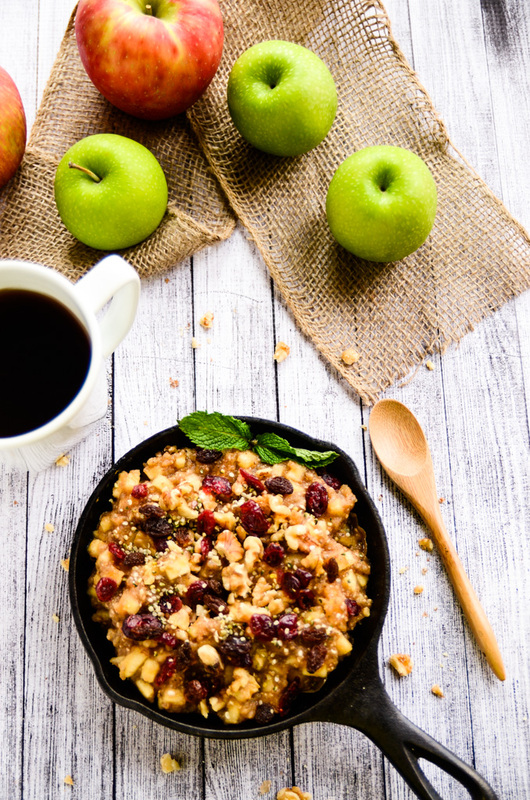 After chilling in the refrigerator for at least one hour (or overnight), the apple-cinnamon deliciousness is scooped into two bowls and topped with raw walnuts, raisins, dried cranberries, and hemp seeds. The result is a light, energizing, and satisfying breakfast bowl that will power you through your morning rather than slowing you down. This breakfast is so easy to throw together, and it’s the perfect pick when you’re looking for something fresh to mix into your weekly oatmeal routine. Plus, it’s packed with nutritional goodness thanks to… well, thanks to every ingredient. Each has an empowered purpose in this breakfast, and the combination will help you get your nutritional glow on in the morning. What can I say? This breakfast has talent. Thank you Blissful Basil for this yummy recipe!! Click HERE for the recipe!